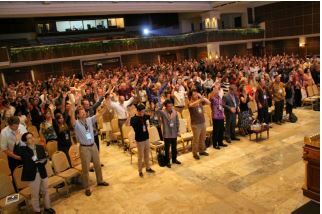 Transform World movement recently brought together over 431 servant catalysts from around the world to Bali, Indonesia. This Transform World Global Challenges Summit (TW GCS 2012) held from November 6-9, 2012 set the stage for a seven year response to 7 key and select challenges facing the global Church today. The gathering served to inform, connect, empower and envision regional and national leaders from over 50 nations with this key message to – revitalize the Church to renew the culture. Chairman Rev. Dr. Daniel Sung-Wook Kim in his opening remarks to a crowd of about a thousand invitees including Indonesian pastors and laity, pointed out “Transformation is the work of the Holy Spirit from start to finish” emphasizing that such a great task can only be accomplished by God’s intervention, grace and mercy. Sensing the urgency of the times, the summit served to issue a call to re-focus on and to re-prioritise on 7 challenges for global mission praxis. “Civilizations develop and flourish in response to the challenges they face with creative new ideas. Acknowledging that the Church is in a kairos moment in history, the Transform World movement is asking God to guide, and the Church to join in discovering His response to these pivotal challenges of our times. v. Human Rights (Justice) Challenge: Reviewing status of main human rights issues including casteism. vii. Celebration Challenge: Praise to God through the Harp and Bowl worship with an emphasis on the Restoration of the Tabernacle of David TW GCS 2012 seeks to be a prophetic voice issuing a catalytic call for change focussing on these serious issues. Convinced that a committed minority can indeed spark a response, servant facilitators from ten global regions have returned to their homelands to raise up a convinced majority to respond to and to initiate a movement that results in renewal of culture! “Transform World continues to be a movement and not an organization; where relational connections empower to fulfil God’s agenda and where personal involvement is sought towards this large overarching global initiative and vision for the Church. TW beckons others to join in this people-oriented service even if it means opposition and misunderstanding.” said Luis Bush, International Facilitator. The summit brought together expert servant catalysts who prior to the conference had built community and vision with their challenge-group delegates. Agreeing on a seven-year working strategy was therefore the goal for each of the challenge groups during the summit. As challenge groups were finalizing their strategies, TW Sphere Facilitators (A-arts; B-business, C-Church, D-delivery of information or media, E-education, F-family, G-governance) had opportunity to speak into relevant challenges adding value and greater synergy. The inter-twining of spheres and challenges went a step further as each of the global regions of the world had region-specific meetings where challenges were discussed and contextual understanding at national and the grassroots level understood. With a call to three generations to engage with the challenges, spheres and regional emphases, the TW movement provides a quadri-focal type of lens whereby the vision can be furthered and engaged with across the globe. Transformation is the progressive and on-going measurable supernatural impact of the presence and power of God working in, through and apart from the Church on human society and structures. In the church, this is characterized by increased holiness of life, reconciliation in relationships, and appetite for prayer and worship. In the culture, this may be characterized by pervasive awareness of the reality of God, a radical correction of social ills, a commensurate decrease in crime rates, supernatural blessing on local commerce, healing of the broken-hearted (the alienated and disenfranchised), and regenerative acts of restoring the productivity of the land. To this end, a catalytic core of saints typically embrace a lifestyle of persistent repentance, humility, and sacrificial servant-hood that attracts the favor and presence of God, and breaks the predominating influences of the ruling power structures of human flesh and negative spiritual forces. 2000 years ago, Jesus Christ said “You are the salt of the earth; you are the light of the world”. The Church is being envisioned yet again to be His agents of transformation proclaiming the Gospel in Word and Deed – holding out the Light for the world to behold. It is our collective prayer for grace to respond as His servants in the Missio-Dei – focusing on ideological strongholds, family values, care of orphans, reaching the unreached, providing justice for the marginalized, assistance to the poor and the restoration of praise, worship and prayer around the globe. Oh Lord, may the world so be transformed!